The second of two FIAT 500L cars used by Pope Francis during his historic visit to Philadelphia in September 2015 will be up for auction through Dec. 20. 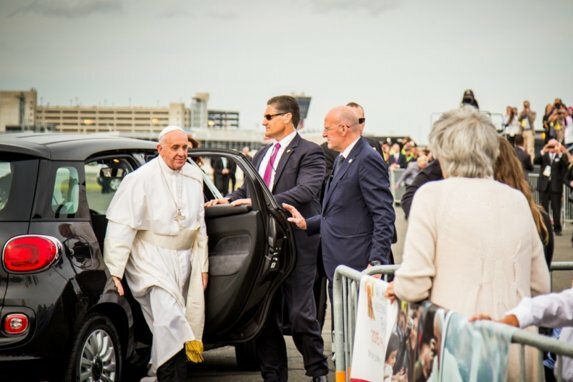 The second of two FIAT cars used by Pope Francis during his September 2015 visit to Philadelphia is headed for auction. Bidding for the FIAT 500L opened 9 a.m. Wednesday and will last until Dec. 20, the Archdiocese of Philadelphia said in a statement. Proceeds from the auction, conducted in partnership with Charitybuzz, will benefit the 2017 Catholic Charities Appeal, which gives support to tens of thousands of people through numerous organizations, programs and ministries within the archdiocese, officials said. "I’m deeply grateful to FIAT Chrysler for its generosity in giving the Archdiocese of Philadelphia the two FIATS used by Pope Francis during his visit to Philadelphia on September 26-27, 2015," Archbishop Charles J. Chaput said in a statement. "When we learned that these vehicles would be given to us, we wanted to use them in a manner consistent with Pope Francis’ call to love and care for the poor. Our partnership with Charitybuzz provides an excellent opportunity to benefit society’s most vulnerable and marginalized members." The first FIAT was auctioned in January 2016, the proceeds from which benefitted Catholic Charities Appeal and various ministries of the Secretariat for Catholic Human Services. More than two years have passed since Pope Francis paraded down the Benjamin Franklin Parkway – pausing from time to time to bless babies and kiss sick children – before serving Mass in Center City to some 900,000 people who turned out to see the pontiff. More on the auction can be found here.